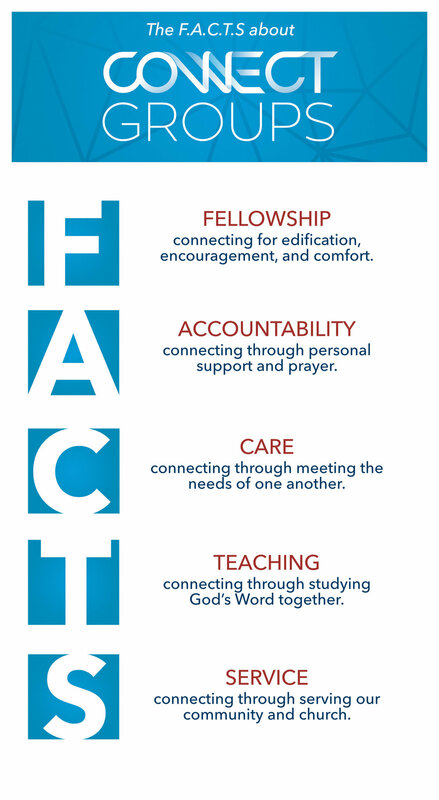 Connect Groups are our Sunday morning adult Bible studies and fellowship groups. We have 6 different options that are designed to meet a variety of needs for our adults. Each class meets at 9:15 am each Sunday morning to fellowship and study God's Word. Whether you are looking for a video based discussion group, a round table discussion, a class on parenting, or a more traditional teacher directed class, we have something for you. Here is a list of our current Connect Groups. Berean Fellowship - Intergenerational, verse-by- verse study of the Bible conducted in an open and interactive style. Seekers - This group is a general Bible study that is for adults of all ages. This class is generally topical and discussion based approach. Adult Bible Fellowship - Small groups that meet in a “round table” format to study God’s Word together. Couples Following Christ - Parents with children who are learning together how to raise their children to be godly in an ungodly world. Young Adults - Both single and married individuals who have started their careers meet to discuss the Word of God and its application to life.